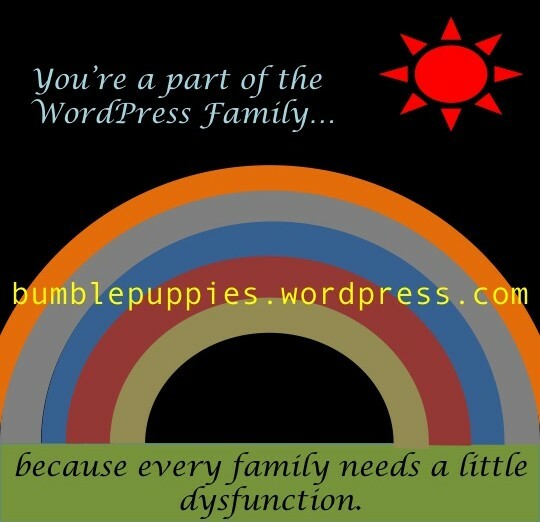 Natasha of Natasha’s Memory Garden has nominated me for the WordPress Family Award. That means it’s another exciting day of shameless self-promotion here at Bumblepuppies! Somehow, the traditional touchy-feely version didn’t quite do it for me. And now it’s time for seven more things you don’t know about me. 1- I enjoyed teaching (which is how I could afford to get through grad school) but the one type of job I don’t apply for is teaching positions in my major. I’m demonstrably competent and qualified to teach related subjects but I’ve had no luck on that front. 2- Even though I occasionally make jokes that imply otherwise, I have no fear of math. 3- I do not have a library card, probably because I don’t read the kind of stuff public libraries tend to offer. 4- Off the top of my head, I cannot name five movies that have been released over the past five years. So… I’m not exactly a film buff. 5- Off the top of my head, I can name dozens of varieties of central- and eastern European pork products. 7- I would love to try chocolate covered grasshoppers. If you know of a shop in the U.S. that ships them, send me a link. Seriously. The 15 blogs I’m nominating will appear after a few more paragraphs. Blogs that were nominated last time were not considered for this because everyone should have the opportunity to advertise my blog. Thanks so much for the shout-out! Love what you’re doing here. Thanks, and don’t mention it. It’s good to get the opportunity to do shout-outs. Thanks for putting Balladeer’s Blog on there! Thanks so much for the nod; it definitely does not insult my intelligence! Oh good. You never know how people will react to these things. In the spirit of complete non-participatory participation, I reblog this very kind mention of a post of mine that I stole from Anais Nin. Awwww! Thanks, Sugs! 🙂 You made my day…and I needed a day made.